We are all very new to the sport and are continually striving for improvement. In the limited time we have been here we have received much support and encouragement and thus far it has been an enjoyable ride. Anything to help us become more integrated with the rest of the club would be greatly appreciated. Here are some of our stories. I now find the exhilaration of a good row, with a friendly crew and motivational coxswain hard to resist, and am happy to row 3 or 4 times a week. I still experience some stress but it’s more about the conditions of the river and whether I’ll be able to get out on the water or not .. I have dropped a dress size, sleep like a log, and have so much energy. The club provides the opportunity to make new friends, take on voluntary activities and to feel part of a warm community.. it’s a fantastic way to increase both your physical and mental well being. Initially, I could barely get in the boat and had to be dragged out! My flexibility was so poor I could only reach ½ slide. However, the craic was good, the people welcoming and friendly and I loved being able to do some exercise, however limited … so where am I, I 8 months on … I can reach full slide with ease, I’m still not comfortable at ‘easy oars’ but I can cope better and we rarely stop and sit still anyway! I rowed throughout the winter in rain, sleet, and snow. 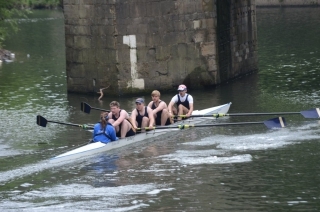 I took part in my first Sunday League regatta. I am now a leaner, fitter, rowing machine with (according to my doctor) the blood pressure of a 19year old. The spectacle of boats gliding along the river had always enthralled me but the prospect of being outside in cold, damp conditions had never seemed particularly enticing so I hadn’t given it much more thought. 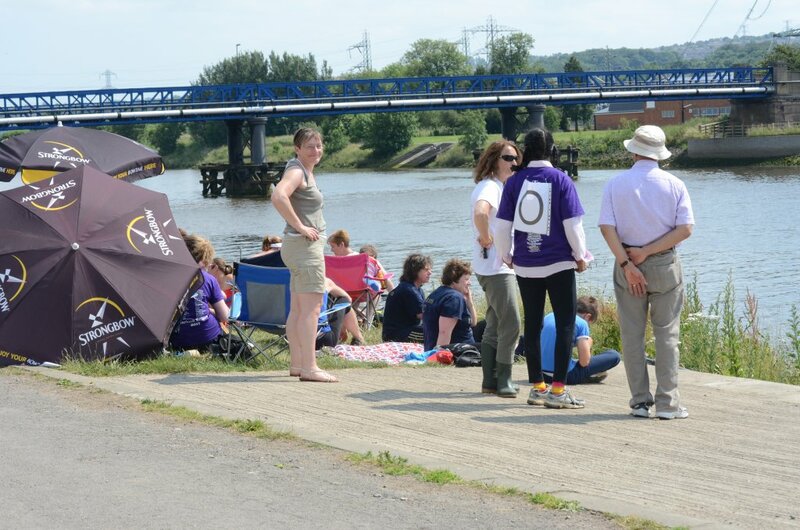 I certainly wouldn’t have had the confidence to go along to a rowing club on my own. Then the Council decided it would like to close down my local leisure centre so I was keen to find some other means of getting some exercise, which was when I found out about the Learn to Row courses. After a year of indecision I finally got round to giving it a try during the fine summer of 2011 and found I thoroughly enjoyed it. Several attendees were seeking to alleviate past health issues and we found the course volunteers very understanding and supportive. Having survived the 10 weeks unscathed many of the course graduates then opted to join the daytime recreational group as, being by now retired, this suited our lifestyle. Being somewhat incompetent at this stage I needed a lot of help and fortunately the more experienced members of the club were falling over themselves to offer it. Some of those who helped us in the early days are sadly no longer with us but their legacy lives on. Caroline organizes us wonderfully and is always so welcoming with her lovely smile, encouraging us no end with her contagious laughter, but she must be fed up to the back teeth co-ordinating the motley bunch of pensioners who insist on turning up in wellies on midwinter mornings demanding to go out in boats when they ought to be tucked up at home in bed. Outings never fail to lift the spirits. Before we even get as far as the river there’s the daily boatlifting ritual which is always great fun and good exercise in its own right with us being assigned the heaviest boats that the club can muster. During my time we have been fortunate to be aided by a series of experienced coaches, all of whom have been brilliant. After our trip out we like to retire to the bar and huddle together drinking lots of coffee whilst hatching cunning training plans which I can’t divulge here lest they be intercepted by members of rival clubs. 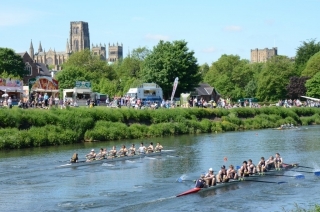 In years gone by I had enjoyed watching Durham Regatta despite having very little understanding of what was going on. Living in my own little world I had no idea what other rowing clubs existed, where they were or how the sport was organized, but after a bit of time and effort the pieces of the jigsaw are finally starting to fit together. The turning point came when we were asked to volunteer to take part in a regatta that had been organized one Sunday in April 2012 so I put my name forward and turned up on the appointed day to discover a throng of people in colourful attire who I had never seen before, but who appeared to know what they were doing. This turned out to be the start of the monthly Sunday League. I had assumed that it was going to be a one-off experiment but it has continued ever since and I’ve so far only missed one of the rounds. This has enabled me to visit most of the other clubs in the region and experience their varied watercourses, which has proved most enlightening. Rowing is very inspirational so it’s easy to be inspired by the successes of members of our club as well as by Olympic athletes. After standing on the riverbank watching a few events I think I’ve almost figured out how regattas work. The experience gained from the Sunday League has encouraged me to branch out further, taking in the Great Tyne Row and Primary Regatta, both of which were great fun. The opportunity to take part at my time of life is fabulous and it can only get better. Indoor rowing is another great way of keeping fit when it’s a bit chilly outside, so having finally learnt what all the options and numbers mean on the ergo machines I was even persuaded to enter the North East Indoor Rowing Championships. Away from the competitive side of things it soon became evident that joining the squad can lead to all manner of opportunities I had never envisaged. Having volunteered to help out with Durham Regatta I found myself becoming engrossed to the point where it completely slipped my mind that I had to leave to catch a transatlantic flight. As well as assisting at rowing events I’ve so far become involved with activities ranging from tree surgery to website maintenance. Among other things the recreational rowers also do DIY, catering and cocktails, creating labour-saving devices, designing trophies, plumbing, painting and administration so there’s never a dull moment. 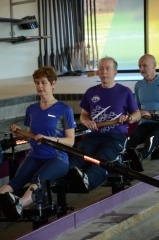 Gene is a regular volunteer in the kitchen and she has used her time there wisely to also prepare some healthy performance-enhancing recipes with a rowing theme, some of which she has been kind enough to share. These have already been tested to good effect on the rec rowers. The DARC influence has spread far and wide. 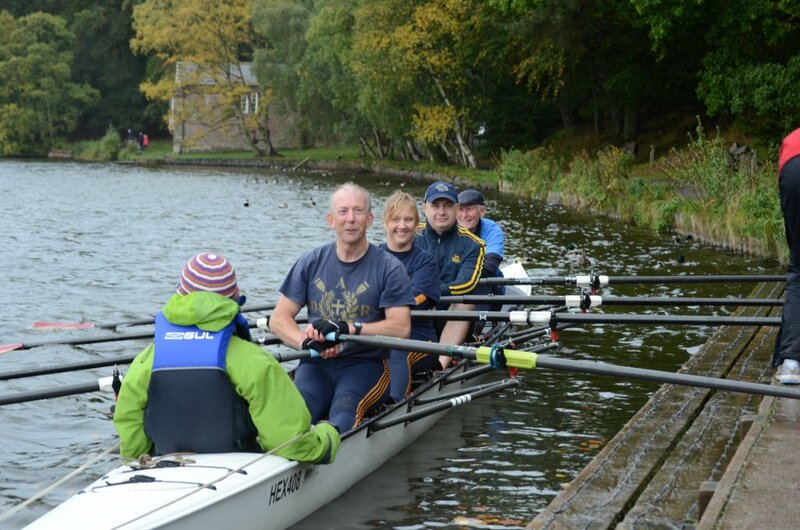 Read Joyce’s sister’s account of how she was inspired to take up rowing.